After being imprisoned in the Shadow Academy and forced to drink the Dragon's Blood Elixer, Delaney manages to flee, a shell of his former self. Once he realizes he's being controlled by Magnus, he leaves the safety of the other Pyr, convinced he'll betray them. He's also convinced he's the only one who can destroy the source of the Dragon's Blood Elixer. After selling everything he owns and making his will, he heads out on his quest, uncaring if he walks away afterward or not. The one thing he didn't plan on though, was having his firestorm the night before the attack, nor meeting the women who gives him his first glimpse of hope in years. Too bad he won't be alive long enough to get to know the woman of his dreams. Ginger doesn't know what to make of the tall delicious stranger who walks into the bar and makes her heart race. All she knows is her gut's never steered her wrong before, so she takes him home, never imagining he'd abandon her in the night. Determined to track him down and force an explanation from him, she's shocked to walk in on a dragon fight. Never in her wildest dreams would she imagine that the man who held her so tenderly the night before would be a dragon, and one intent on tearing his opponent to pieces. Knowing she's setting herself up for heartbreak, she refuses to leave him, even knowing what he is. But can this haunted warrior be redeemed by love, or will his desire to end his quest also destroy his life? This is book 4 of the series and it's still going strong. 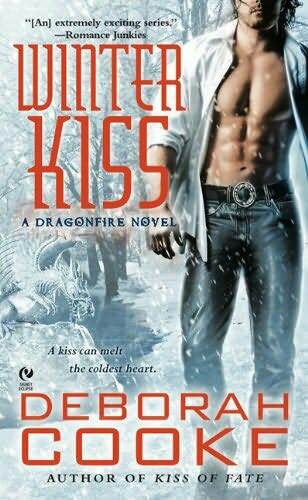 I've been reading nothing but Deborah Cooke's Dragonfire series for the past week, so I'm fully comfortable in the world and the characters. I will say though, I wanted to punch Delaney in the mouth more than once. Stupid man thought the only way to complete his mission was to die, not taking into account what anyone else would have to say about it. But I kept reading, knowing he'd (hopefully) come to his senses and accept the help from his fellow Pyr. Deborah Cooke is a master storyteller, one whose grasp of the written word to transform you to another world is beyond phenomenal.